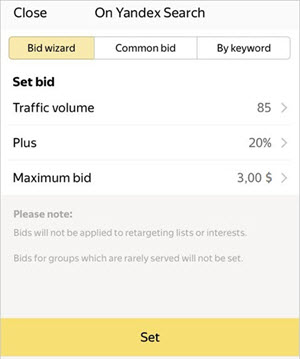 You can set bids for keywords and autotargeting in the app. Other impression criteria (such as retargeting lists and mobile app interests) do not appear. How do I set a bid for all keywords in a campaign, ad, or ad group? How do I set a bid for a single keyword? How do I find out the coverage for a keyword? On the campaign, ad or ad group screen, tap → Bid Wizard. Note. Bid Wizard is not displayed for campaigns using automated display strategies that do not provide for manual bidding. If your impression strategy allows you to manage bids individually, you can choose to set bids for search only, YAN only, or both at once. You can either set a single bid for all keywords , enter a bid for each keyword separately, or use the Bid Wizard. In the wizard, specify the parameters of the bid calculation and tap Set. Note. If you choose to set bids for search and ad networks simultaneously, the Bid Wizard will not be available. For example, for a keyword bid to get 85% of the traffic volume is 1 US dollar. If you choose "set bid to get 85% of the traffic volume + 20%", then the set keyword bid will be 1.20 USD. (1 + 0.2 × 1). On the screen for the campaign, ad group or ad, find the required keyword and tap it. Specify your bid and tap Set. By default in the coverage column there are dashes in the keyword list. To get information, swipe the phrase to the left and tap Actions → Download prices. How do I set a bid for all keywords in a campaign, ad, or ad group?How do I set a bid for a single keyword?How do I find out the coverage for a keyword?